The American people have spoken loud and clear. They want their newly elected Congress to focus on job creation and economic growth. Voters rejected increased government spending, higher taxes, a government takeover of health care, and the burdensome regulations that have delayed our recovery and have caused crippling uncertainty for businesses. This election confirms that America is still a free enterprise nation. Read and respond. 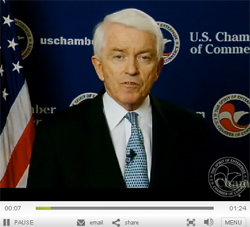 The U.S. Chamber's focus on a pro-growth, pro-jobs agenda during the heated 2010 midterm elections resonated with American voters and resulted in a wave of pro-business, Chamber-endorsed candidates being elected to the next Congress. Voters in last week's midterm elections want the next Congress to advance legal reform and rein in organized labor, according to survey data released by the U.S. Chamber of Commerce. Read more. An Opening to Boost U.S. Exports? In a sign that relations between the White House and the business community may be thawing, President Obama has embarked on a nine-day trip to Asia with the purpose of opening foreign markets to American business. Read more. Your voice counts. Respond to the following four questions and receive instant results. Take the poll. Has the sluggish economy impacted your pricing? What, if any, changes have you made to your employees' health benefits in 2011? What are your expectations for the new Congress? Compared to last year, how do you think your sales will fare this holiday season? "Americans Voted for Jobs and Economic Growth"
Highlight your company's success and apply for the 2011 DREAM BIG Small Business of the Year Award. Or nominate a business from your community by January 7. The winner will receive a $10,000 cash prize. Discover exceptional values on quality products at Sam's Club®. Make a cost comparison at your local Club and find savings on items you already purchase that exceed the annual Business Membership fee. When you join or renew in Sam's Club, you'll receive a $10 gift card. Just print off the certificate available at www.uschamber.com/samsclub and present it at the Member Services Desk.